Raising funds or just having fun? Host a carnival and get ready to have a blast! 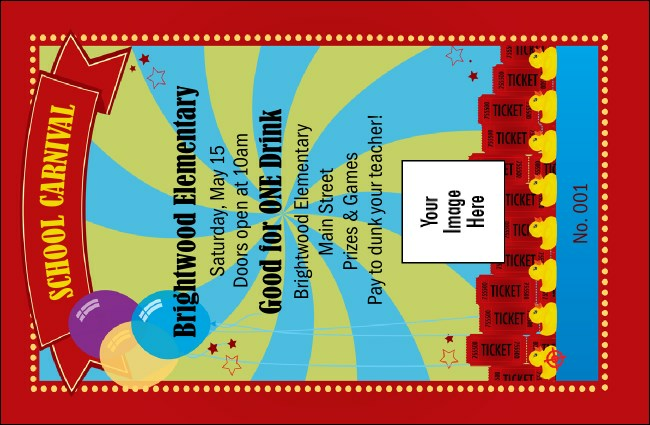 The School Carnival Drink Ticket helps you manage all of your thirsty guests, so they can bypass the concession stand and get in line for the kissing booth! Each is individually numbered so you can easily track your sales. Ticket Size: 4.14" x 2.71"
With the help of a TicketPrinting.com Event Kit, a good time was had by all.